When it comes to quality tree and lawn service in Mechanicsville, homeowners turn to C.S. Flournoy for all their lawn needs. We provide comprehensive service that covers all the major areas of your lawn. Our expertise includes tree clearing, trimming, removal, and feeding, pesticide spraying, bush hog mowing, Mechanicsville stump grinding & removal, and deep root fertilization. All of our services and products are guaranteed for your absolute satisfaction. You'll love our personalize service, fast work, and affordable rates. Contact C.S. Flournoy and let us help you get your next tree project off the ground. We are the tree and lawn experts! Fungus and insects not only affect your yard, but can also eventually creep inside your home causing massive damage. With the right pesticide you can rid your lawn of these destructive forces and preserve the lush beauty keeping your landscape healthy and attractive all year long. We provide a thorough inspection of your yard in order to identify all the potential problems and their causes. Our pesticides are environmentally friendly and will not cause any harm to your plants. They focus on the critical areas and give your property total protection. Are you getting ready to build a new home or launch a landscaping project? Why not start with a clean, level yard? We offer full yard clearing services that provide you with a fresh palette upon which to build any structure or design any lawn from the ground up. We have a full line of equipment that can effectively clear out all trees, brush, roots, and weeds. Once the clearing is complete, you'll be able to do anything from pouring foundations to planting new grass seed and give your property a fresh start. If you have a deteriorating tree on in your yard, then there's a chance that it come crashing down onto your car or home. Let C.S. Flournoy remove your dead trees before they collapse and cause severe damage or destruction to your property. We can clear areas we home addition or construction may take place and give you an open area. We remove all trees and debris and completely clean up your yard. When the job is done there will be no trace of the tree or the stump and your yard will have a smooth even finish. Over time your trees will experience overgrowth and begin to clutter up your yard. If you have two trees close together they will begin to grow into each other and ultimately stunt growth and cause other problems. 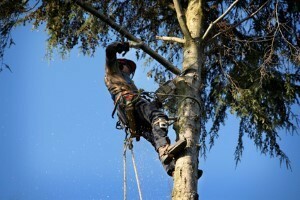 We offer complete tree trimming service from top to bottom. We clear out the excess branches while grooming your tree making it an attractive feature in your yard. Trimmed trees stay clear of any power lines and offer a safer alternative to expanding growth. Routine trimming also gives your trees improved health and longer life. Contact the Mechanicsville tree and lawn service professionals today and let us beautify your yard with newly trimmed trees. If you are looking for Tree and Lawn Services in Mechanicsville, then please call 804-264-1000 or complete our online request form.